Historical Marker #589 commemorates when the Leitchfield courthouse was burned during the Civil War. Twenty- two courthouses were burned during the Civil War. Most were purposely destroyed while some met an unfortunate accident. The Leitchfield courthouse was purposely set ablaze on December 24, 1864, by Confederate soldiers commanded by General Hylan B. Lyon. Lyon was the grandson of Matthew Lyon and the son of Chittenden Lyon, for whom Lyon County was named. In April 1860, Lyon joined the Confederate army as first lieutenant in Captain Robert Cobb’s battery. During the Battle of Fort Donelson in February 1862, Lyon was captured by the Union army and imprisoned at Johnson’s Island, Ohio. Released that September, Lyon became a brigadier general. From September 1864 until the spring of 1865, he commanded the Department of Western Kentucky. Lyon was responsible for burning several western Kentucky courthouses during the war. After the conflict, he retreated to Mexico but returned to Kentucky a year later. He served as a state prison commissioner, and was primarily responsible for the Kentucky State Penitentiary being located in his hometown of Eddyville. Lyon died in Eddyville in 1907. The current courthouse located in Leitchfield, Kentucky, is the fourth courthouse for Grayson County. The first three were lost to fires that destroyed some or all of the records. The first fire was the 1864 fire, the second was in 1896, and the third burned in 1936. The fourth courthouse was built in 1938. 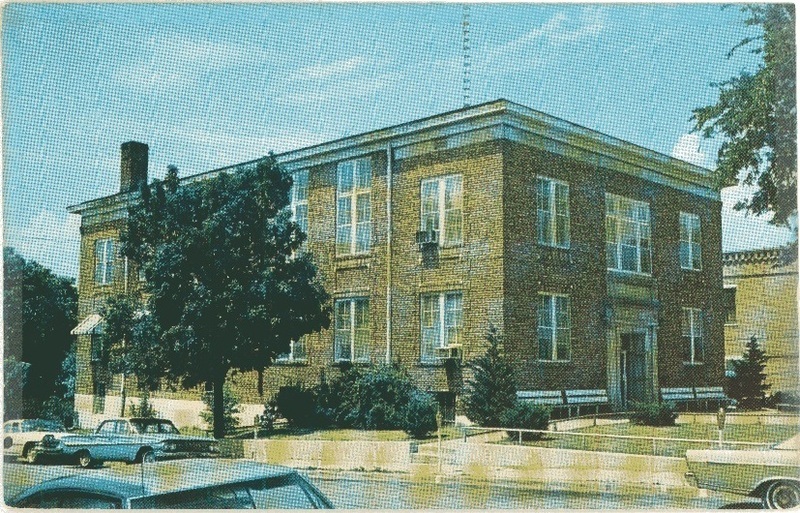 Grayson County Courthouse: The current Grayson County courthouse as it stood in 1964. Courtesy of Kentucky Historical Society. Matthew Lyon: Matthew Lyon, Hylan Lyon’s grandfather, was born in Ireland and immigrated to Vermont in 1764. He represented Vermont in the U.S. Congress from 1797 to 1801 before settling in Kentucky in 1801. This image mockingly depicts Lyon holding aloft fire tongs after being insulted by Roger Griswold of Connecticut. Courtesy of Library of Congress. Trigg County Courthouse: The present Trigg County courthouse. The original was also burned by General Lyon in December 1864. 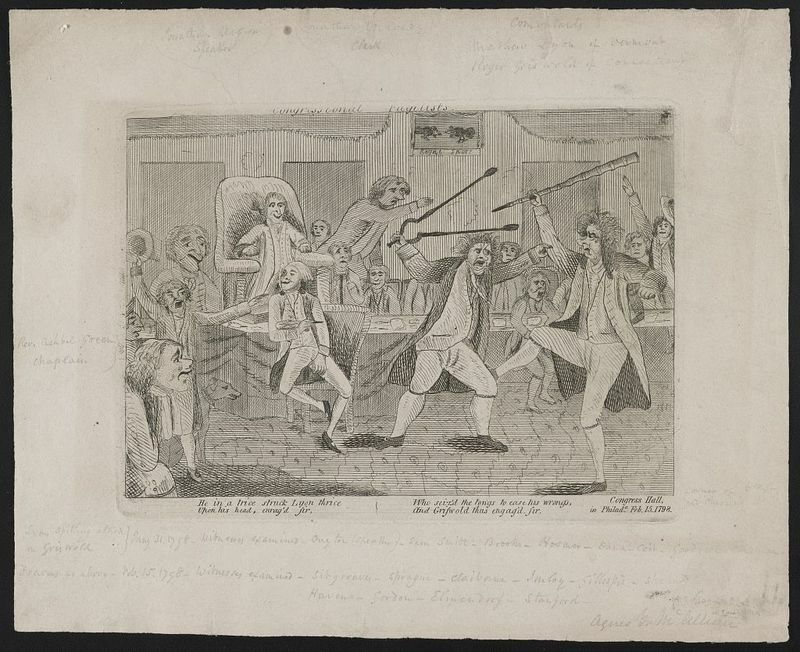 Courtesy of Kentucky Digital Library. 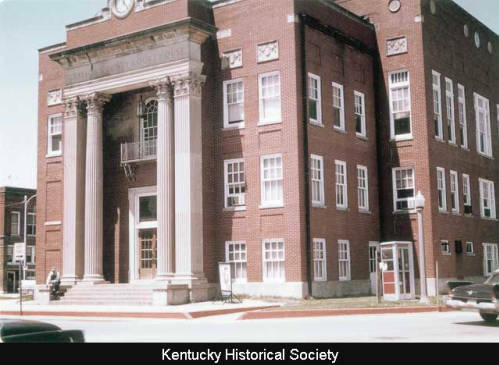 Ashlee Chilton , “Courthouse Burned,” ExploreKYHistory, accessed April 22, 2019, https://explorekyhistory.ky.gov/items/show/643.